6. Batteries: Zap, but How? b. What is energy? Energy is the ability to do work and it comes in a variety of different forms. Thermal energy (heat), radiant energy (light), kinetic energy (motion), electrical, chemical, nuclear, and gravitational energy. There is stored (potential) energy like chemical energy (glycogen in humans) and working (kinetic) energy. c. What is redox potential? Two simultaneous chemical reactions, one called an oxidation and one called a reduction. The flow of electrons requires both an electron donor and an electron receptor. The movement of electrons is the definition of electricity. The process of oxidation and reduction produces ions (charged species) that stops the process of reduction and oxidation, which is why you need an “ion current”. Often, separating the two sides and two solutions is useful. Energy is lost as heat – thusly, researchers want to cut down on the amount of heat lost from batteries. ii. What is an electron? A particle. Electrons reside in orbitals around the nucleus. They contain a negative charge. 2) When were batteries first developed? a. Timeframe: The first traditional (true) battery was invented in 1800 by Alessandro Volta (Voltaic cell!). It was made up of stacks of discs of copper and zinc, separated by cloth soaked in salty water. This is a great example of how batteries work because two compounds or metals are separated with some kind of porous insulator. There has to be a conducting fluidic to allow the transfer of soluble ions from one metal to the other. Electrons flow from the anode to the cathode. b. Types of batteries: Nickel cadmium (nickel as the cathode, cadmium as the anode, professional video cameras, power tools, long life, economical price, toxic metals). Nickel-Metal Hydride (nickel cathode, alloys with many metals as anode, phone / laptop battery; reduced lifespan, high energy density, no toxic metals). Lead Acid (lead as anode and lead dioxide as cathode, cars, cheaper for large power applications if you can hold something heavy). Lithium Ion (Li metal cathode, carbon anode, notebook computers, phones, high-energy density, light weight, fragile, flammable electrolyte liquid). 3) Current efforts in battery technology? a. Esther Takeuchi: Distinguished professor at Stony Brook best known for developing an improved battery for powering implantable defibrillators using lithium / silver vanadium oxide technology. Dr. Takeuchi recognizes that your batteries don’t always just wait to do work until they’re called upon: understanding where those things happen explains the phenomena that limit lifetime. Common techniques to study batteries include MRI and high-energy x-rays from synchrotrons to see where reaction products are forming (to see things like what is limiting the reaction: electron access, ion access, etc). i. MRI: Magnetic resonance imaging. Powerful magnetics (strong enough to throw a wheelchair across the room) produce a magnetic field that force protons (in this case found in water) in the body to align in that field. A radiofrequency field is turned on to stimulate the protons, which spin out of equilibrium. Turning off the field allows scientists to measure the time it takes for the protons to go back to alignment and how much energy was released. NONINVASIVE, no damaging radiation. ii. Synchrotron: A synchrotron machine exists to accelerate electrons to extremely high energy and then make them change direction periodically. The entire world of synchrotron science depends on one physical phenomenon: When a moving electron changes direction, it emits energy. When the electron is moving fast enough, the emitted energy is at X-ray wavelength. The resulting X-rays are emitted as dozens of thin beams, each directed toward a beamline next to the accelerator. KIND OF LIKE A RACETRACK FOR ELECTRONS. The storage ring is a long tube where the electrons circle for hours close to the speed of light. The tube is maintained at very low pressure. As the electrons travel round the ring, they pass through different types of magnets and in the process produce X-rays. The X-ray beams emitted by the electrons are directed toward "beamlines" that surround the storage ring in the experimental hall. Each beamline is designed for use with a specific technique or for a specific type of research. b. Mike Zimmerman: Professor at Tufts University. Attempting to make batteries without the electrolyte solution. Solid sheet of a special polymer (think plastic) that allows ions to travel to and fro between anode and cathode. Acts as a total physical barrier, so no corrosion. Interesting part of a NOVA documentary ‘Search for the Super Battery’ in which this battery is cut apart piece by piece and has no explosive characteristics. a. Sulfuric acid from car batteries: Lead sulfate happens over time because of the lead and sulfuric acid battery. Charging leads to lead and lead dioxide and breaks apart the lead sulfate. Small sulfate crystals, typically normal and unharmful, form on negative plates. Over time, the lead sulfate becomes a stable crystal structure that reduces the battery life. Happens at a low state of charge for extended amounts of times. The alternator acts to charge the battery on modern cars. b. How can a battery be rechargeable? Chemical reactions reversed by supplying electrical energy to the cell, restoring their original composition. Zinc-carbon and alkaline batteries are not rechargeable because their chemical reactions are not readily reversible. c. The Baghdad Battery: 2000-year-old “battery” from roughly 250 BCE to 250 CE. It’s a clay jar with an asphalt stopper. 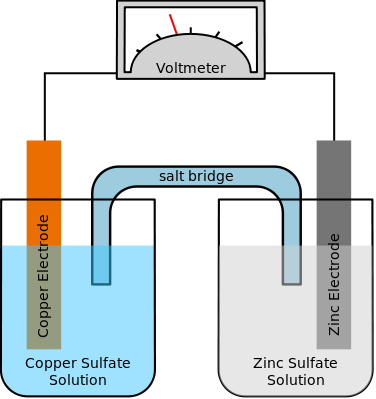 An iron rod surrounded by a copper cylinder allows the contraption to act as a battery when filled with an electrolyte solution like vinegar (1.1 volts). Maybe used for putting a layer of a metal onto the surface of another (called electroplating). a. How are batteries recycled? A lot of it is physical and heat methods. Metals have distinct characteristics that allow for separation to be done: fractionation, if you will. Those can further be used for more battery production down the line. EG: Lead acid batteries are separated into plastic, lead, and sulfuric acid. The sulfuric acid is neutralized and turned into water or converted into sodium sulfate (a detergent).